This page lists some of the mentions and stories of The Joy of Sox in the press. Please click on the links to take you to the story. 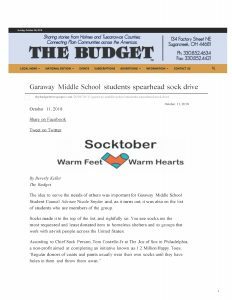 The Budget (Sugarceek, OH) reported on a sock drive at Garaway Middle School that was inspired by The Joy of Sox, a nonprofit that provides new socks for those experiencing homelessness. The Budget (Sugarcreek, OH) reported on a sock drive at Garaway Middle School local school that was inspired by The Joy of Sox, a nonprofit that provides new socks for those experiencing homelessness. The school’s student council conducted to drive for the month of October. Two students involved in the drive and the student council will be sent Certificates of Appreciation. The socks will be delivered locally to the Tuscarawas County Friends of the Homeless Shelter. Click the image to the right to read the entire article. The Joy of Sox® is a nonprofit with the mission to provide joy to the homeless by giving them new socks. Their vision is to be the best sock charity in the United States and give six pairs of new socks to every homeless in America every year. Founded in 2010, they have made a positive impact on the live of the homeless by distributing over 277,300 pairs of new socks to the homeless around Philadelphia, 33 other states, Washington D.C. and five countries. 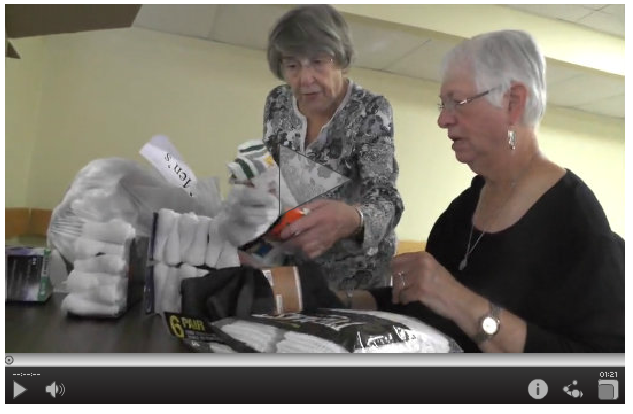 A photo from Voice of America’s article about Helping America’s Homeless with Socks. The article highlights The Joy of Sox®, a nonprofit that provides new socks for the homeless, and Tom Costello, Jr., founder and Chief Sock Person. 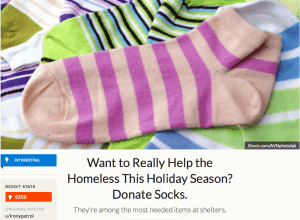 Voice of America did a nice story on Helping Homeless with Socks. The article tells the story of how Tom Costello, Jr., used to homelessphobic, but went on to found the nonprofit The Joy Of Sox, where he is the Chief Sock Person. Clicking on the photo will take you to a PDF of the story. Pictured in the story are: Villanova female student athletes sorting socks for distribution to shelters; Tom and Nancy Costello with socks (what else? ), Some homeless in the Kensington section of Philadelphia, and a high school student handing out socks to the homeless as part of his Eagle Scout project. The Joy of Sox® is a nonprofit with the mission to provide joy to the homeless by giving them new socks. Their vision is to be the best sock charity in the United States and give six pairs of new socks to every homeless in America every year. Founded in 2010, they have made a positive impact on the live of the homeless by distributing over 235,000 pairs of new socks to the homeless around Philadelphia, 31 other states, Washington D.C. and four countries. 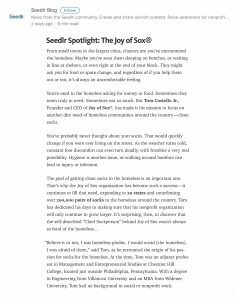 Seedlr article about Tom Costello Jr, Chief Sock Person & Founder of The Joy of Sox. The Joy of Sox is a nonprofit the provides joy to the homeless by giving them new socks. Seedlr is a new website. And they recently did a nice story on The Joy of Sox® and Tom Costello Jr, their Chief Sock Person & Founder. Seedlr is a community for activists to create and share content about causes and to donate to nonprofits. 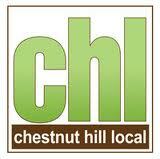 They aim to support local startups to worldwide organizations. Their goal is to raise awareness for NPOs working to do good. The Joy of Sox is a nonprofit with the mission to provide joy to the homeless by giving them new socks. Founded in 2010 they have made a positive impact on the live of the homeless by distributing over 200,000 pairs of new socks to the homeless around Philadelphia, 28 other states, Washington D.C. and three countries. The article was written by Ted Winston a Villanova University graduate. Mr. Costello is also a graduate of Villanova. To learn more about The Joy of Sox click here. To learn more about Seedlr click here. The Joy of Sox® is a nonprofit with the mission of providing joy to the homeless by giving them new socks. Founded in 2010 they have made a positive impact on the live of the homeless by distributing over 194,000 pairs of new socks to the homeless around Philadelphia, 28 other states, Washington D.C. and three countries. Main Line Today, a regional magazine in the suburbs of Philadelphia published a “5 Favorites” profile of Tom Costello, Jr, Chief Sock Person and founder of The Joy Of Sox®. Here’s a very nice article that Michelle Woo wrote for Reddit’s Upvoted. Click on the photo to read a pdf of the story. To read to original story on upvoted.com click here. Grey Nun Academy sorts new socks for the homeless for The Joy of Sox – a nonprofit that provides joy to the homeless with new socks. Spurred on by Pope, nuns and volunteers bring “Joy of Sox” to homeless. The Grey Nun Academy, Yardley, PA ran a sock drive and held a sorting and packing event in October 2015. The Buck County Courier Times covered the the event and published this video. And a special thanks to Maryellen Glackin for her superb job on camera. Jill Horner, on-air host with Comcast Newsmakers, interviews Tom Costello, Jr, from The Joy of Sox, about new socks for the homeless. Thanks Jill and Comcast!! Laura Jones, on-air host with Comcast Newsmakers, interviews Tom Costello, Jr, from The Joy of Sox, about new socks for the homeless. Thanks Laura and Comcast!! Steve Highsmith, host of NBC10’s In Focus, interviews Tom Costello, Jr, from The Joy of Sox, about new socks for the homeless. Thanks Steve and NBC10!! 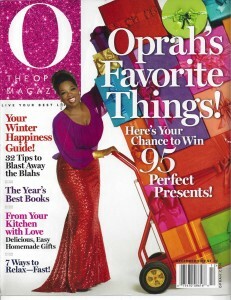 The Joy of Sox and Tom Costello Jr were written up in the December 2012 issue of O Magazine. The story is on their mission of providing new socks for the homeless. Please click picture to see the story online. 6ABC News – Philadelphia. Click image for story. Click on image to get link to story.